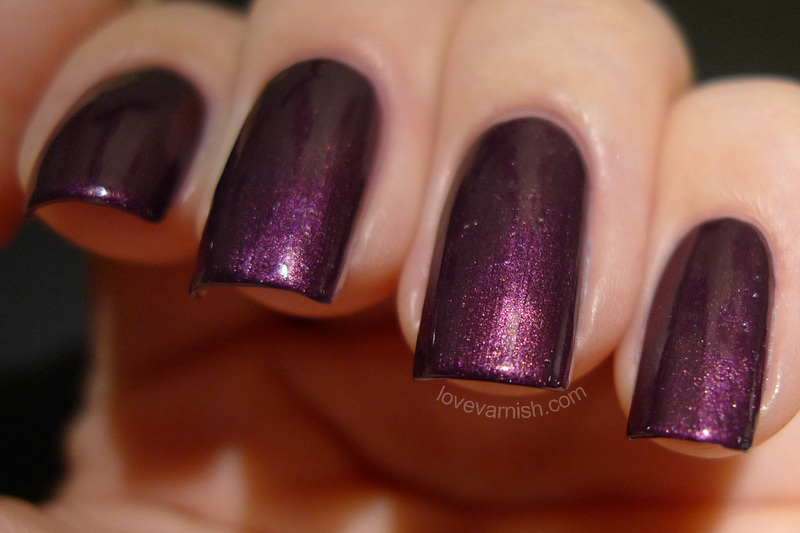 Love Varnish: Swatches & Review - 2 BRAND NEW Catrice shades! Hi loves! Today I have 2 BRAND NEW Catrice shades called First Class Up-Grape and Must-Have STEELetto for you from the most recent collection update. I grabbed the 2 I found most interesting, since I am not all that impressed with this release. And unfortunately, one out of these 2 isn't my favorite either.. let's get to it! With this release, the brush is still not my favorite, but it seems the brush cap isn't as flimsy anymore. These bottles are now €2,99 in The Netherlands which is an increase in price I believe. Other than that no changes! 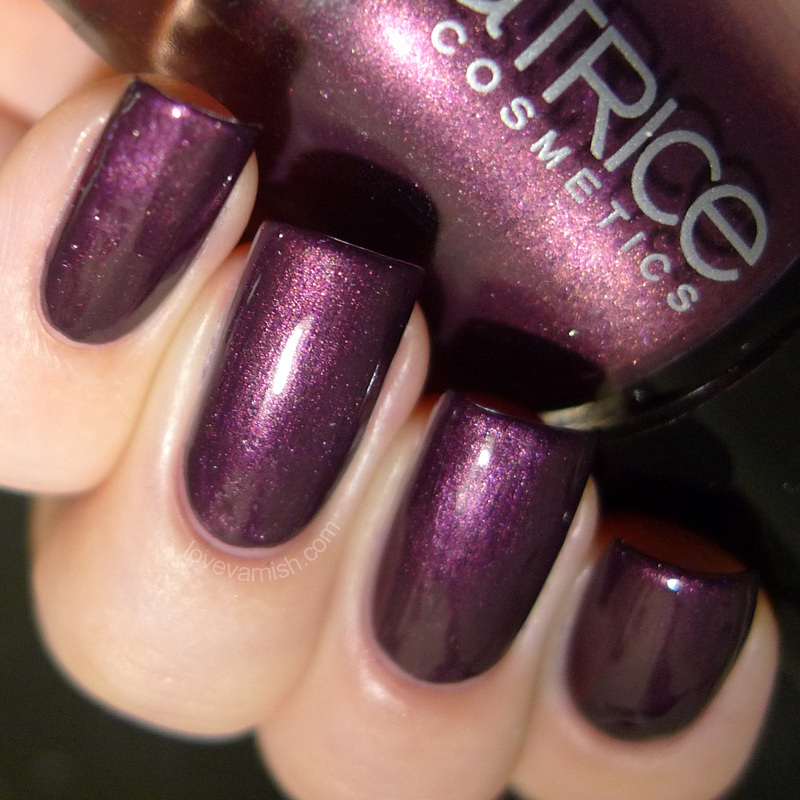 Catrice First Class Up-Grape is a deep dark burgundy shade with a heavy shimmer, though not metallic nor frosty in finish. It reminds me of a shade released with China Glaze's Fall collection last year. I was pleasantly surprised with this one, since it's almost opaque in a single coat. That means it'll probably work for stamping, too! The formula is a bit thick but good to manage, and in 2 coats you are done completely. It looks nice and shiny already but I finished with a top coat just to make it perfect. Great Fall shade and a nice addition to my stash! Catrice Must-Have STEELetto looks like a lilac foil in the bottle, but on the nails it's more silver with a hint of lilac. This did not please me much, it looks so messy on the nails somehow! The formula is sheer and I needed 3 coats for proper opacity, which I am not used to with finishes like these. It did apply easy, it spreads evenly and easy and isn't patchy at all. Be careful though to not overwork a layer or it'll clump! Like I said this disappointed me on the nail, however the shade is pretty and it is blingy for sure! Which of these would be YOUR pick? Tell me in the comments! I'd also pick First Class Up-Grape, that's my kinda shade! Both are fab colors! Especially First Class Up-Grape. I LOVE purple - I wish Catrice was easier to get in my area! I love both, so pretty! omg that grape! so juicy! STEELeto needs to be mine pronto! I am going nuts over your nails! Such stunning colors, especially the purple! Yeah it feels better now, though I am still not entirely sure. But it would be time for them to fix it lol! It's so lovely! Thanks Kerry! Do you want my bottle? Because I won't be wearing it anymore I guess! If you ever need a mule, I always LOVE shopping for others :D! Aww you are so sweet Laura! :-D if you ever need some Dutch goodies, feel free to drop me a line! o wow i love these shades, especially for fall! Thank you, they sure fit a colder season! They look gorgeous! Very classy and fall appropriate!